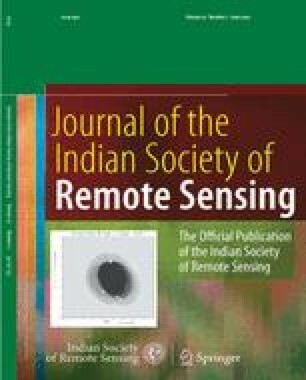 This present study was conducted to find out the usefulness of SWIR (Short Wave Infra Red) band data in AWiFS (Advanced Wide Field Sensor) sensor of Resourcesat 1, for the discrimination of different Rabi season crops (rabi rice, groundnut and vegetables) and other vegetations of the undivided Cuttack district of Orissa state. Four dates multi-spectral AWiFS data during the period from 10 December 2003 to 2 May 2004 were used. The analysis was carried out using various multivariate statistics and classification approaches. Principal Component Analysis (PCA) and separability measures were used for selection of best bands for crop discrimination. The analysis showed that, for discrimination of the crops in the study area, NIR was found to be the best band, followed by SWIR and Red. The results of the supervised MXL classification showed that inclusion of SWIR band increased the overall accuracy and kappa coefficient. The ‘Three Band Ratio’ index, which incorporated Red, NIR and SWIR bands, showed improved discrimination in the multi-date dataset classification, compared to other SWIR based indices.